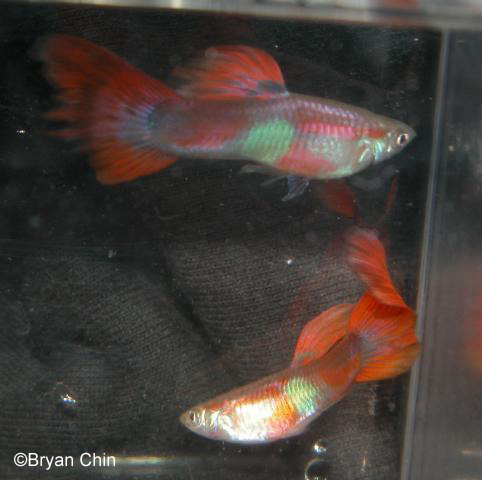 These male wild guppy crosses to female fancy guppy experiments helped demonstrate the genetic influence of female guppy. 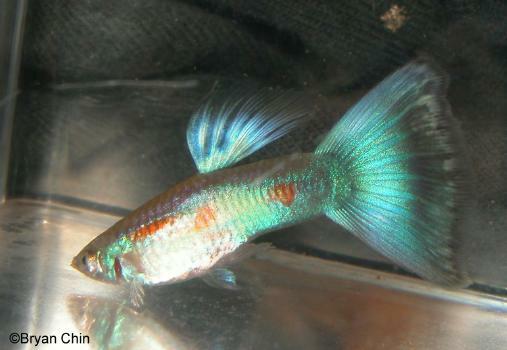 Though these results are not all encompassing of the female fancy guppy genetics, it is a window to understanding it. I learned many things from this cross and it convinced me how important it is to observe female color, fins, and shape for choosing breeders. 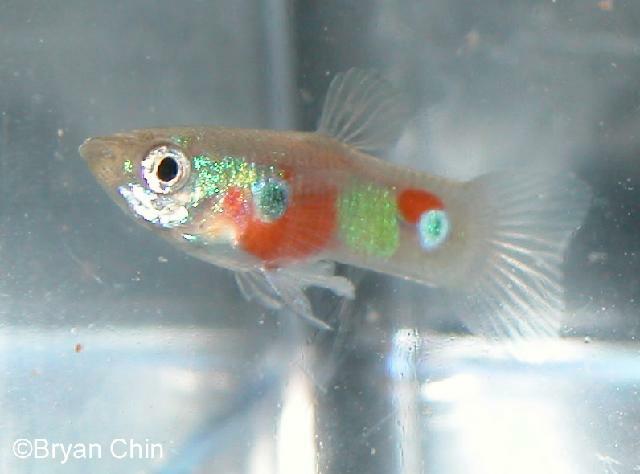 When I was at a local pet store, I noticed in the feeder guppy tank a wild type guppy that displayed a bright green patched on its body. I bought this guppy to try an experiment with crossing to my fancy guppy lines. My other goal was to see if I could invigorate my lines and to see if that green patch would carry through. I took note of the wild type guppy’s body markings and the clear fins to see how they would change or not from the cross. The clear fins indicate that the male carries no traits for fin color and that the cross will indicate the female’s influence. The wild male’s fins were short and never increased in size with time and looked forward to how the fancy female would show her influence on tail shape and size. My first cross was to a female with purple highlights in her tail. She came from a line that gave blue/green and purple males. The brothers of the females are shown below. The cross the results showed that the female carried both blue/green and purple traits. It is interesting to note that the female was able to influence the color of the wild cross’ tail color which resulted in purple and blue/green sons. 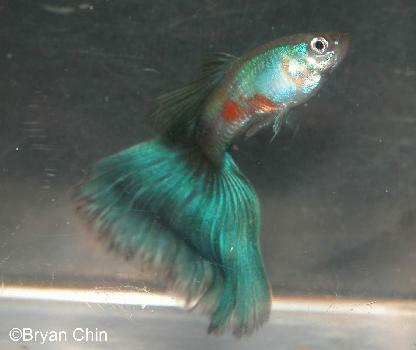 The dorsal fin color was white variegated with some iridescent highlights that were the same as the tail color. This showed that the female passes on a white background but not the solid color to match to the tail. I believe that this explains that the male must carry the matching solid dorsal color for the blue, green and purple traits. The tail shape resulted in a veil tail angle (45 degrees) and the tail did grow to a one to one proportion with the body length with time. The delta trait from the female combined with the wild guppy’s trait gave an intermediate result. The dorsal also lengthened but was thin. 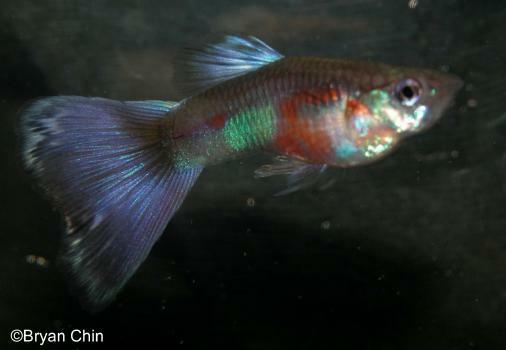 Results of the wild guppy to fancy female with purple tail highlights are shown below. I discontinued using males from this line due to the white and non-matching dorsal that would not go away with crossing back to females from my fancy lines. I did use the females from this cross back to my blue/green line to invigorate them and they still are a part of my blue, green, purple and Moscow lines. (To see my lines with this background go to the Rocky Mountain Guppy Association site www.guppywest.com) It is important to note that it took quite a few generations and breeding back to lines to get the tail angle back to a delta (60+ degrees). This may indicate that the wide tail is influenced by multiple genes to accomplish the delta tail. The dorsal had no problem becoming solid color with using fancy males with solid dorsal back to wild cross females. With this same wild male I crossed him to a red female from my fancy red guppy line. The brother of the red female is shown below. The breeding results of the tail were surprising to me. The ragged shape and short tail showed that this red female did not carry the same traits as the blue/green/purple female. I wish I had more room to cross to more red females, but I must say that my red fancy male guppies never showed these ragged and short traits. It could be an indication why my red line is so resistant to getting good tail lengths like by blue/green/purple lines that can meet or exceed the length of the body. I feel that many red lines also have this problem. The dorsal gave a different results compared to the other cross. 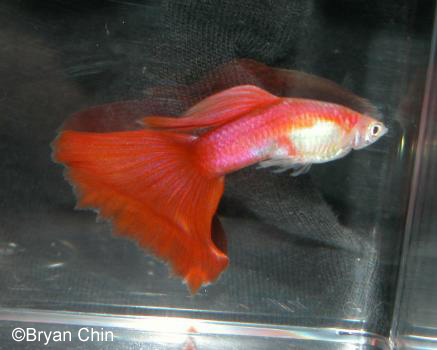 The dorsal of the red/wild cross resulted in red color that matched the tail which was inherited from the female. Also note that the dorsal was thicker than the previous cross. 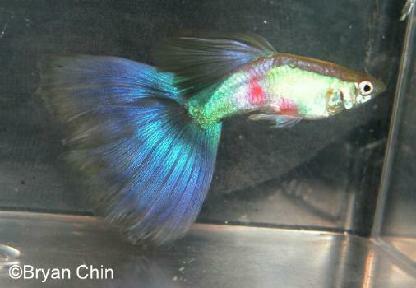 It is hard to know if the dark variegation in the fins would show if it was a gold body phenotype. I did not carry this to F2 since the results were so poor to see how the gold version would look. Also note the body’s green patch and red patches from the wild type male appeared on his sons. The female was able to influence the red color on the peduncle. In conclusion these crosses showed that females from different color lines can differ in some traits that can influence the male phenotype. 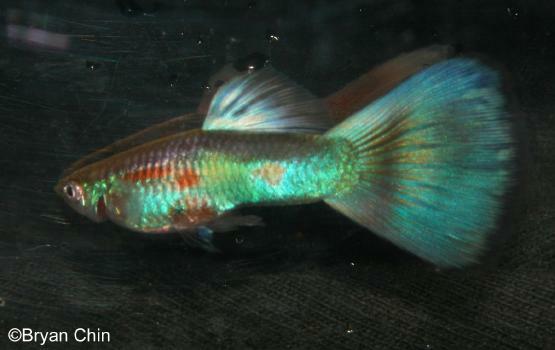 The differences could be due to how guppy breeders select females to get the desired color for different lines. I wish I was able to do more crosses with many females from the same line and to cross other lines to make a solid conclusion, but I feel that these results can give a basic guide to guppy hobbyist to understand how the female guppy can influence breeding results.